The new version of ChildrensReferendum.ie published this evening did not mention the proposed removal of Article 42(5) from the Constitution. 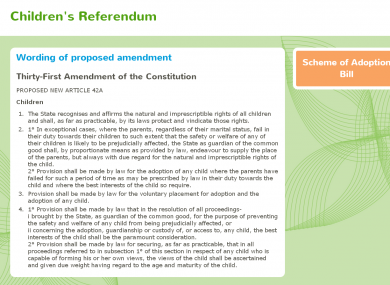 THE GOVERNMENT has published a slimmed-down version of its website on the Children’s Rights referendum, after this morning’s Supreme Court ruling – and amended the text of the revised website after it emerged that the text published on it was incomplete. The Supreme Court this morning ruled that the ChildrensReferendum.ie website published by the government in September was in breach of the terms of the 1995 McKenna ruling – in that it contained language which implicitly advocated a Yes vote in Saturday’s referendum. The website was taken offline within an hour of that ruling being published, and was this evening restored with most of its content removed – containing only the text of the proposed new article 42A, which would be inserted into the Constitution if Saturday’s vote is passed. However, the text displayed on the website upon its return this evening was not a complete version of the referendum text being put to the public – as the single-page website had omitted a reference to the proposal to delete a section of another Article elsewhere in the document. The edition of the website which returned this evening – shown in the image above – did not include a reference to the proposal which would see Article 42(5), dealing with the removal of a clause which is superseded by a portion of the new text. Alongside the inclusion of a new Article 42A, the proposal being put to voters on Saturday also includes the removal of Article 42(5), which already provides that the State shall “endeavour to supply the place of the parents” if the parental role is not being fulfilled by the child’s own parents, though always “with due regard for the natural and imprescriptible rights of the child”. Though this clause is superseded by the provisions being included in the new Article 42A, the wording of the new article is slightly different – in that it removes a clause which says the State can only exercise this role if the child is being failed for “physical or moral reasons”. This was not referenced on the new website when it first appeared this evening – and only appeared after the replaced website was amended at about 9pm this evening. Email “Children’s Referendum website corrected after omitting part of amendment”. Feedback on “Children’s Referendum website corrected after omitting part of amendment”.